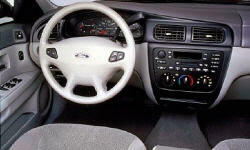 Why the 2004 Ford Taurus? The redesign was clean, crisp, simple, and sharp. They sold a bazillion of these things! Marketing genius, soccer moms, rule! The Duratec V-6 is bulletproof, one best engines Ford has ever made. Big and cavernous, would hold three adults easily! Seems like they should get respectable MPG. 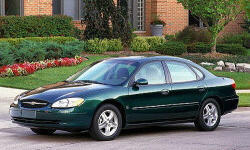 Why Not the 2004 Ford Taurus? Very blah. Like a taxi cab. Generous, but very conserative. Everything felt cheap, and the vinyls felt slimey. Poor fit and finish overall. Too upright, not enough range of movement for my tall frame. I looked under the visor to see the road. Very stiff and choppy, not impressed at all. Rode like a taxi cab.